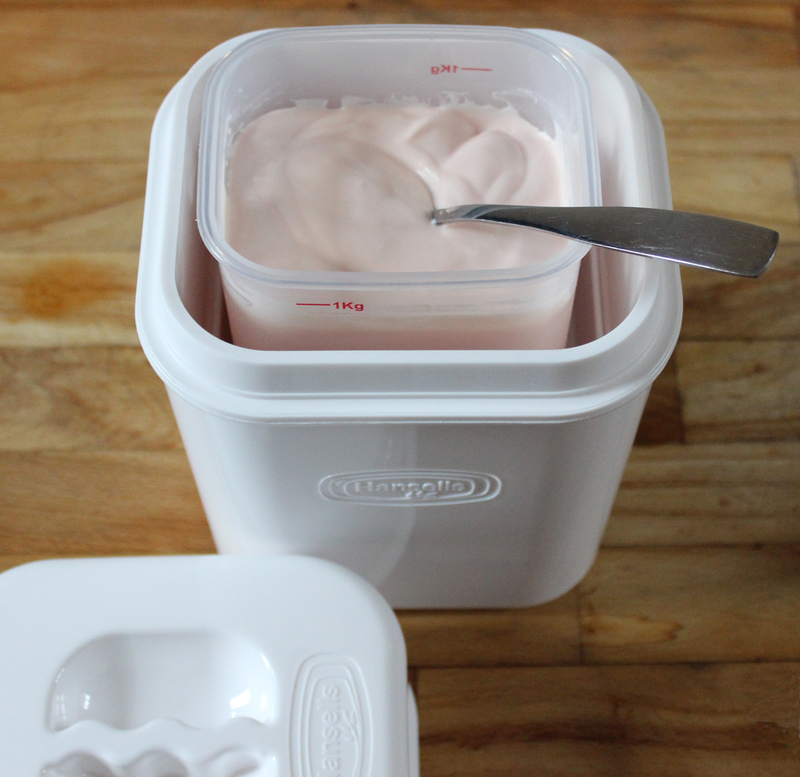 Having recently been sent the Hansells easy-to-use yoghurt maker to try, here's how I got on. The Hansells Yoghurt Maker Starter Kit contains mixing tubs and six sachets of yoghurt for £15.00 which personally I think is a great price. It's really simple to use too - just 3 steps. Half fill the yoghurt tub with clean drinking water (15-20⁰C). Add yoghurt mix, secure lid and shake well. Make up to the 1kg level with more cool water. Replace lid, shake well then release air from container and reseal. Pour boiling water into your yoghurt maker to the specified level line. Place tub into yoghurt maker and immediately shut maker lid. Leave for 8 hours or overnight until set. Remove from maker and place in the fridge to cool. Some separation may occur. Gently stir before serving to produce a smoother texture, if desired. Hansells Yoghurt will keep fresh for up to 2 weeks in the fridge. Very impressive, I must say the finished yoghurt was lovely; thick and creamy and full of flavor. Having used the Easiyo (a similar yoghurt maker) in the past, I can say I much prefer Hansells since the yoghurt mix really does mix just by shaking the container; no whisk needed! The Easiyo really needs a whisk to mix properly. 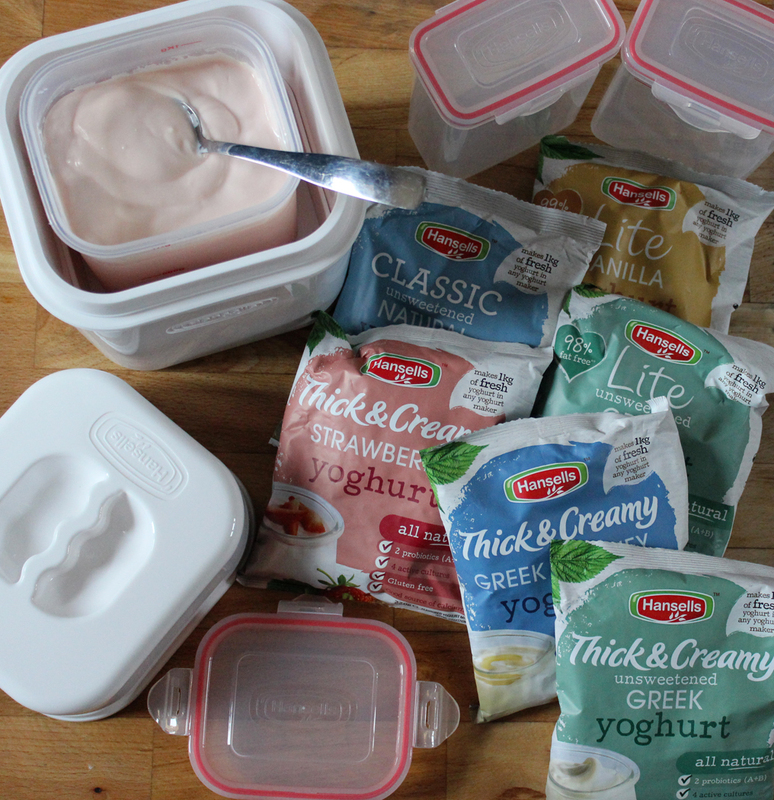 The Hansells containers are a great shape for the fridge and you can actually make two different flavours at the same time simply by using half a sachet in each 500g container; two 500g containers sit side by side in the yoghurt maker. I've found the seals on the containers are excellent too and better than the brand I just mentioned. Making your own yoghurt means it's far fresher than supermarket yoghurt and contains 4 active live cultures including acidophilus and bifidus, which is great for helping the digestive system break down food. No artificial colours or flavours and no stabilisers or preservatives. So, all in all the Hansells Yoghurt Maker gets a big fat YES from me! Each sachet produces 1kg of yoghurt, extra sachets are available from £1.85 at Hansells Yoghurt website and can be used in any yoghurt maker. Classic or Greek style yoghurt, regular or ‘lite’ low-fat version, and include honey, strawberry and vanilla. 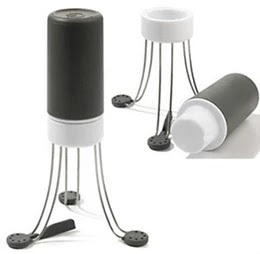 The Hansells Yoghurt Maker is a great Christmas gift for health loving foodies; veggies; mums and elderly relatives. Pop over to www.hansellsyoghurtuk.com for more information. Disclaimer: I was sent the Hansells yoghurt maker along with some extra sachets to try. All thoughts and opinions are my own. As always I was not required to write a positive review.